Do your brain a favor, watch these educational films. 3/4" Baboon, GMHT34R7. RPM = 1275, SFM = 250. IPM = 32.5, at a 30% step over. Cutting: 6AL4V Titanium. 1-1/4" 5 flute Phenom. 2.0 Axial engagement. 1-1/4 5 flute Phenom. 2.0 Axial engagement. GMHT12R7 1/2" Baboon. A2, 28 Rc. 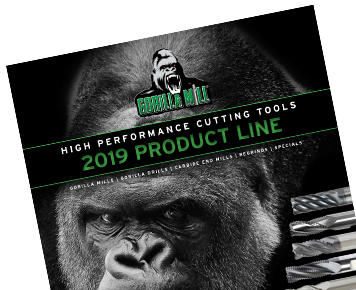 The Gorilla Mill GMAKD12C4, 1/2" Silverback Knuckledragger obliterates 6061 Aluminum at a large manufacturing facility in the northeast. Nearly stalled the machine because the Silverback KD was hungry for more. GMHT12R7 1/2" Baboon. Pre hard 4140, 32 Rc. 6700 rpm. Took it from 50 min for 4 slots to 5 min for 4 slots. 410 SFM @ 72 IPM. Was running 410 SFM @ 5 IPM. Gorilla Mill 1/4" 4 flute ball: Titanium bliss. 500SFM 7640RPM.